I have been trying to find ways to reduce my family’s impact on the environment in ways that are low-impact on our family. I also try to find things that are inexpensive or save us money at the same time. Regardless of how much money you have, it’s always good to save money where you can, at least so you have it for other things! “Brown bagging it” or taking your lunch to work or school, rather than buying every day, can definitely save money. Taking your lunch in reusable containers also saves money over buying plastic & paper bags, foil, etc. There are several websites that are now selling reusable lunch kits that come with an assortment of containers to go in your lunch box. These are very pretty with all matching pieces. If you’re rich, by all means, this may be something you want to spend your money on. Be sure you have enough containers to pack several meals at once so you can have some in the fridge, some in the dishwasher and some out at school. I prefer the flexibility and cost of a more ad-hoc system. For the outer container I bought each of my children a lunchbox at our local Mothers of Twins Club sale. I picked up containers that were in excellent shape for just a couple of dollars. My husband uses either a plastic shopping bag (in case of leaks) or one of the cooler bags that we have received on occasion as free giveaways. Buying used is good for the environment because it creates a market for things that would otherwise have been thrown away. For the food containers I have a number of Ziploc and very small Gladware containers. We prefer the Ziploc brand because the containers are pretty study and stand up to repeated uses and washes over a period of several years. Ziploc is made by SC Johnson and they have several statements throughout their websites stating that their containers are BPA and dioxin free and safe to use in the microwave. On Ziploc.com click on “Ziploc FAQ” in the left column for the statement in their own words. Unfortunately, they do not make a small enough size for some of our purposes, so we use Gladware for the smallest size. Gladware also has a statement about their products being BPA free. I also like the Ziploc and Gladware containers because they are what I consider “semi-disposable.” They are fairly inexpensive, therefore if they are lost, cracked or accidently thrown out, I am not upset that I have lost an expensive piece of kitchenware. I find the 2.5 cup square Ziploc containers are exactly the right size for a sandwich. An added benefit of this over a plastic bag is that the sandwich never gets squished in the container! Remember all those squished sandwiches you ate in elementary school? I’m pleased that my children have not had to have that experience. 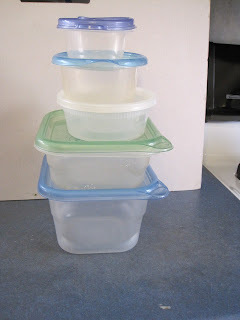 We use the 4 cup square containers for my husband’s entrees, often something leftover from the night before. I have discovered that some people actually throw away their leftovers – it is much better for the environment – and your pocketbook – to eat them! 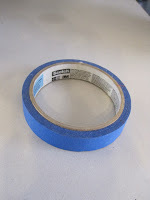 We put the children’s names on the lids with blue painters tape and the labels stay on through multiple dishwasher runs. This allows us to just grab a lid with a name on it to save time in the morning. 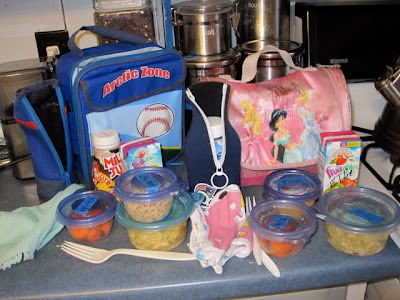 Everyone gets plastic forks and spoons in their lunch boxes and they all know that these are not one-time-use items! For beverages the children get a mix of juice boxes and milk. Juice boxes are recyclable in our town. We’ve come up with a unique way of sending milk to school. We have collected a few of the hard plastic milk containers from McDonald’s and Wendy’s. (We prefer the shape of the Wendy’s bottles, but the McDonald’s ones are acceptable.) These bottles hold up quite well in the dishwasher. For my daughter we use what is technically a beer bottle cozy that zips up the side. (Get one with a sports logo, not a beer label!) This keeps the milk cold, at least for the 4 hours until her lunch time. My son’s lunchbox came with a bottle insulator very much like the other cozy, that actually attaches to the outside of the lunchbox. This is the best solution, but has been hard to find for both children. As of the writing of this we realized that we haven’t been putting any napkins in their lunches, disposable or otherwise. I’m going to try to pick up some inexpensive cloth napkins to put in their lunch boxes and we’ll let you know how that works out! To summarize: 2nd hand lunchboxes, semi-disposable, interchangeable containers, plastic silverware, reusable milk bottles and cloth napkins. Everything comes home and it gives you a good idea of how much your children (and husband) are actually eating! ps. We’ve found that it’s helpful to send a note into the teachers letting them know that we are expecting the children to bring everything, including the plastic silverware, back home. For drinks, I really like the rubbermaid reusable juice box (I found it at Stop and Shop in the tupperware section). I’m not a fan of juice boxes as I like to water down the juice I give my kids so a reusable container gives me more options. I stick a few ice cubes in to keep it cold until lunch. Another fun (and locally-made!) product is a snack taxi http://www.snacktaxi.com/index.htm . It’s a reusable bag and they’re so cute! You run the risk of sandwich-smooshing again, but I just pack it on the very top of the lunch. It takes up less space than a container! I also like these for bringing snacks in the car when we’re on long trips. I find that a zero-waste lunch makes me think more about what I’m packing, and I find it fun, too! I like the idea of the milk bottle in a beer cozy. I’ll have to try that. I’ve just been sending water in a stainless steel bottle in my daughter’s lunch. I’ve seen a reusable/washable cloth wrap for sandwiches, but there is the risk of a smashed sandwich. What a card: Thanks for the tips on the Rubbermaid juice boxes and the cloth napkins. I’ve been looking for a good source on cloth napkins. I’m with you on the juice boxes for preschoolers, I didn’t let them have straight juice then either. Regarding how this will go over in elementary school, I’m hoping that my children will be more leaders with their reusable lunches than followers of disposable. So far they really like it. Even when we send the occasional disposable bag or some such it tends to come home with them! One way I’ve been working on this is instilling the idea in them that throwing things away is bad for our planet. I’m tempted to reach out to the PTO about doing some education for parents on how easy it is to do reusable and on what is recyclable in our town. Anything I can do to help others! Check out the posts under our “Getting Started” tab on “Starting with Children” and “Teaching Children About…” about some of the things we’ve done with our children. It definitely helped that they learned some in preschool as well. They have even gotten stubborn about putting things in the recycle bin, they want to reuse everything first! Chelsea: I’ve seen those reusable cloth wraps for sandwiches and I just don’t understand the appeal over using containers. I would think that the bags are harder to keep clean than the containers are? I wasn’t aware that juice boxes are recyclable here. Is this also true of similarly styled quart-sized containers, like I might see with broth, shelf-stable milk, or BPA-free (like the “Pomi” brand) tomatoes? I have all sorts of different reusable containers for lunches, including some very tiny ones that I found at a dollar store. The Rubbermaid “lunch blox” line looks promising, but I haven’t tried it. Our only disposable lunch item is an occasional cheese stick, but sometimes instead I cut block cheese and separate the slices with a bit of waxed paper, and put that into a tiny plastic container. The paper separation may not strictly be necessary.